I've not been hibernating this winter but very busy on my geological research, since the winter months are far easier for fieldwork in areas where there's loads of bracken in the warmer part of the year. It's not been a cod season this winter, with just a few fish reported among the normal whiting, dabs, flounders and dogs. Big news is that at some marks south of Aberystwyth, spurdogs were landed. These interesting fish used to be a fairly frequent sight before excessive commercial fishing wiped them out in the 1990s, so it looks as if stocks may finally be recovering. I recall catching one off the big breakwater at Fishguard back when you were allowed to drive onto it – that was a long while back now! I'll certainly be out hunting one later this year. Good news regarding bass in that anglers can keep one specimen a day in 2019, from April 1 through to October 31, as long as it's in-size (more than 42cm). I tend to eat fish in the 3-4lb range as they have bred at least once by the time they are that big and they are well tasty. Bigger, older females are our prime spawning stock and should be put back to continue doing their job – bigger bass are not such good eating in any case. So to the future and I will be offering all the usual trips from early April onwards. It's not been an especially cold winter, so the winter species are still with us and I expect, barring a disaster, that the summer species should be roughly on time too. Today's sea temperature at Aberystwyth is 8.9C which is at the high end for March - last year it was a lot colder than that, so I am optimistic. Targets next month will therefore be bass, rays and turbot that could well put in an appearance whenever winds are onshore but not too strong, giving some nice surf. I've already had some enquiries and I suspect more folk will takeup fishing just to escape from the ongoing grind that is politics in the UK, 2019 style! 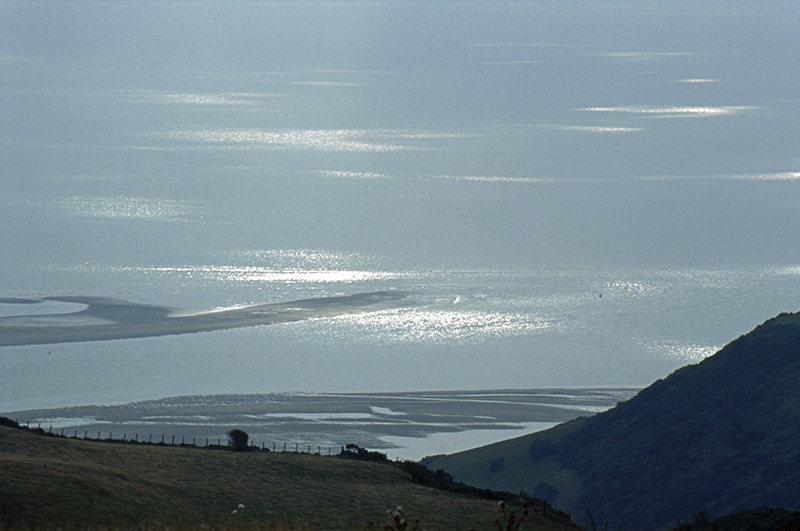 The image below is interesting as it shows the Dyfi mouth on a very low spring tide, with the long sand-bars heading out to sea either side. These are rarely accessible and not for enough time to put in a proper session, but to the south there are other sandbars and gullies within casting range - they shift about with storms of course, but patterns in the surf give away their positions. All good spots to check out once the sand-eels are in the shallows and their predators come a-looking.... more soon!